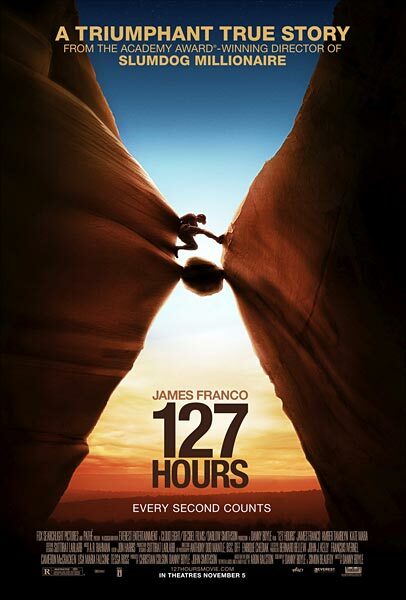 Just saw the movie 127 hours. 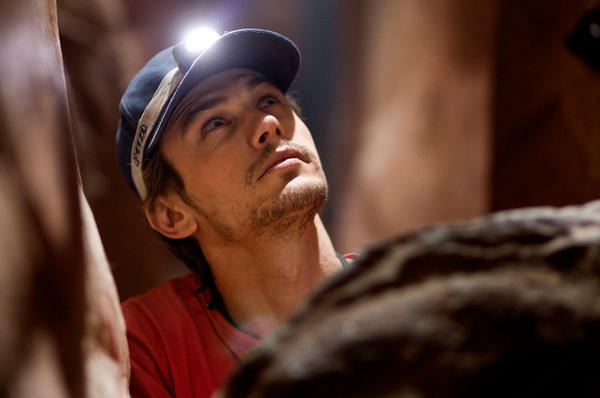 127 Hours is the true story of mountain climber Aron Ralston’s remarkable adventure to save himself after a fallen boulder crushes his arm and traps him in an isolated canyon in Canyonlands National Park of Utah. Over the next five days Ralston examines his life and survives the elements to finally discover he has the courage and the wherewithal to extricate himself by any means necessary, abseil a 65 foot wall and hike over eight miles before he is finally rescued. Ralston was 150-yards above the final rappel in Bluejohn Canyon. He was maneuvering in a 3-foot wide slot trying to get over the top of a large boulder wedged between the narrow canyon walls. He climbed up the boulder face and it seemed very stable as he stood on top. As he began to climb down the opposite side the perfectly balanced 800-pound rock shifted several feet, pinning his right arm – he was trapped. Within the first hour after becoming trapped Ralston had calculated his options and came up with four possible solutions. Death was a 5th possibility that Ralston didn’t want to consider. 1. Always let someone know where you are going. 2. If possible, don’t go it alone. 3. Make sure you take your Swiss Army knife. 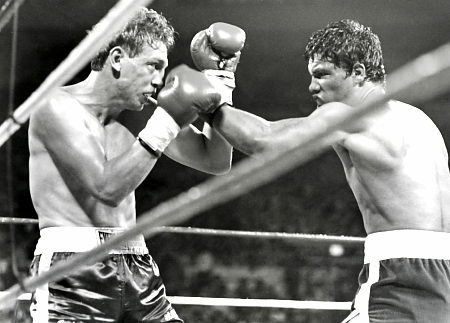 What an amazing story of survival and a prevailing spirit. The route: Glenwood to Atlantic (64.2 miles); to Carroll (65.4) to Boone (70.9) to Altoona (56.1) to Grinnell (57.5) to Corralville (75.3) to Davenport (64.8). 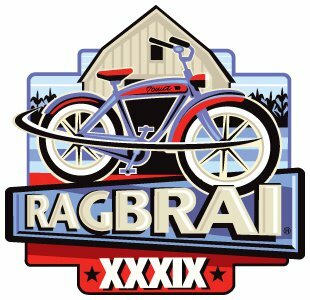 From river to river this would be the Ragbrai I would love to do because the route finishes in my hometown of Davenport. Gonna work on the schedule to try and make it happen. 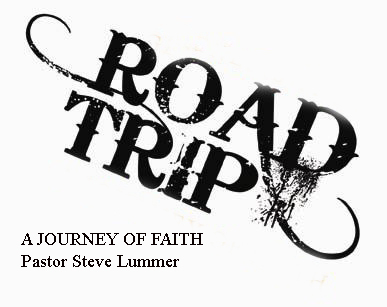 I am looking forward to our last message in a series called ROAD TRIP this Sunday at Prescott First Assembly. This Sunday at 10:00 AM we will be looking at the narrow road that is ahead of us. Unfortunately, Map Quest.com does not provide directions to the narrow road. Only Jesus can provide the necessary directions. I’m loving the study of Jesus words….They never bore me. The latest edition of BACKPACKER magazine has a very interesting article regarding Evangelicals and the environment. If you are a Christ follower and an outdoor lover you might what to pick up the March issue and read the “Hike Pray Protest” article. This movement is resonating with a lot of people who are in the Evangelical ranks. I was first introduced to the phrase “Thin Places” in Mark Batterson’s Book Wild Goose Chase. 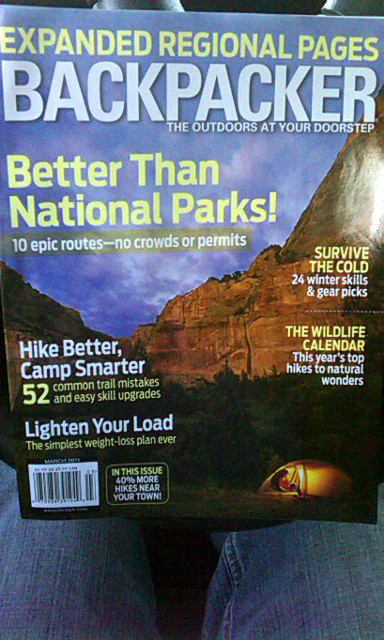 Now I’m reading about it in BACKPACKER magazine. The early Celtic Christians had a name for places where heaven and earth seem to touch. A place in nature where the spiritual and the natural came together….They called them “thin places.” The place were the wall between you and God more permeable and thinner. I totally agree with my Celtic forerunners. Anyway read the article for yourself and see if you have a kindred spirit with the author. I just wanted to post a few pics of our Dad/Daughter excursion to the desert from last weekend. 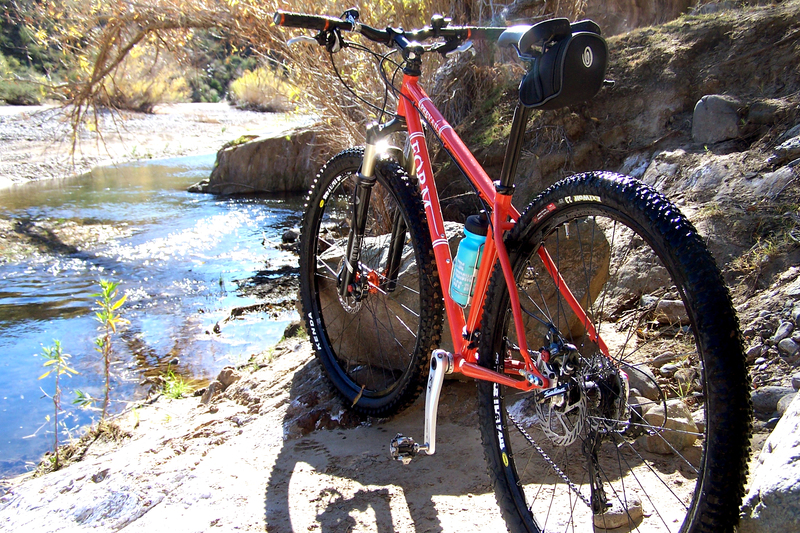 One of the best ways to get to where everyone else is NOT is on a mountain bike. 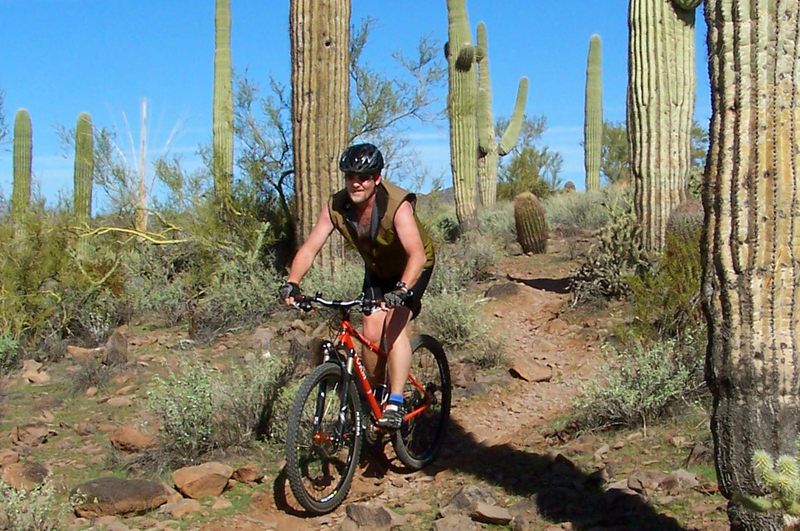 My daughter Natascha had a little window of time so we took off for the desert on the bikes. 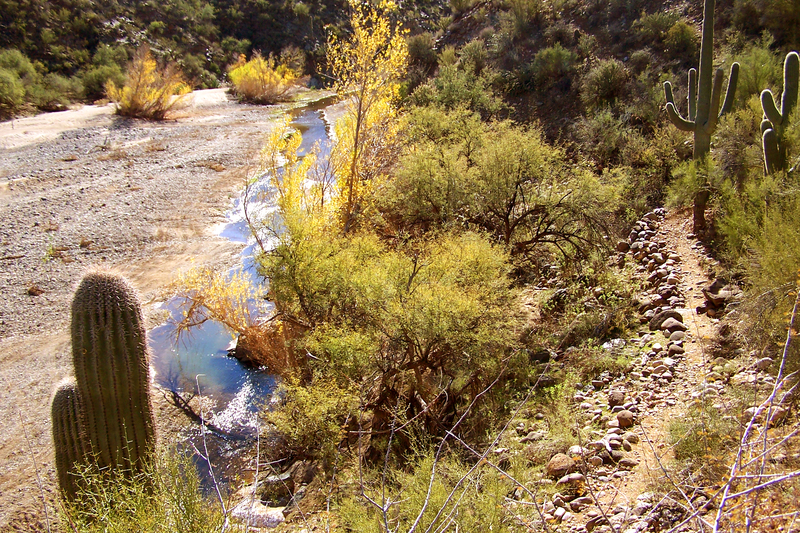 Tash on the BCT (Black Canyon Trail). 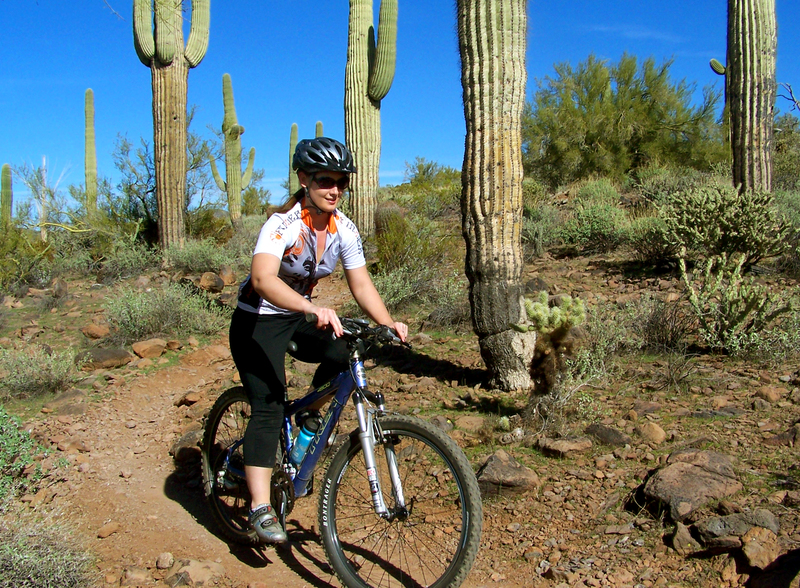 Mountain biking is fun…but it is more fun with Tash – what a great day. Our first water crossing on the BCT. Click the pic with your mouse to get a better view. 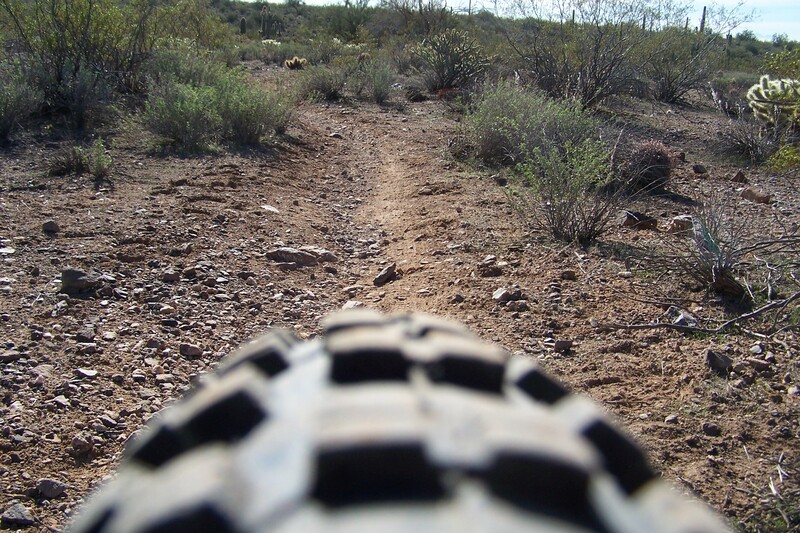 Just can’t beat a view like this – What a great trail system right in our back yard. I love this quote about the difference between critics and contenders. 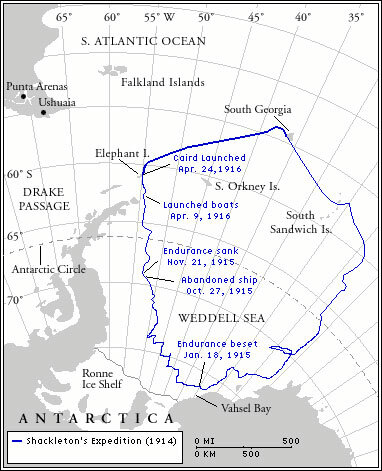 I love the story of Earnest Shackleton and his crew’s attempt to be the first men to explore and travel across Antartica. 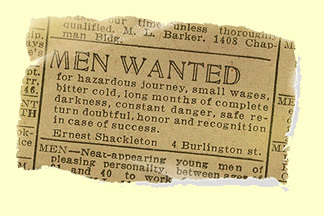 Here is an advertisement he posted in the news paper just before the journey. 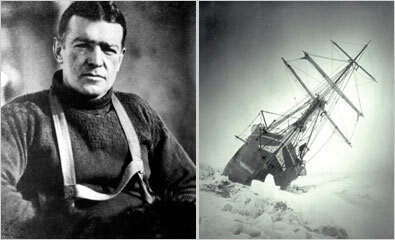 In 1914 Ernest Shakleton headed toward the frozen Antartica in a ship called “The Endurance” with 28 crew members, with the purpose of being the first man to cross the massive slab of ice. Everything was going just fine until he actually reached the beginning of his goal. 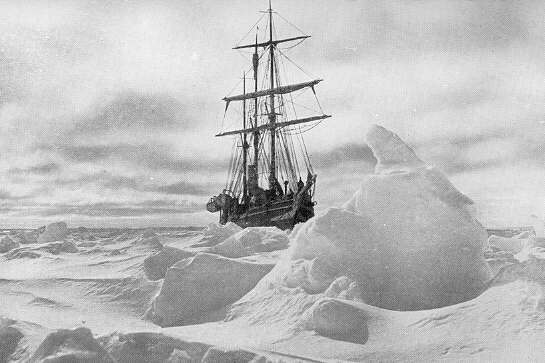 were still held in the clutches of the frozen waters with nope hope of continuing their adventure. A thousand miles from the nearest civilization , they eventually had to abandon their ship and set up camp on the ice floe were they sat and watched their ship sink caused by the pressure of the crushing ice. With their camp set up on the ice floe they were hoping that it would drift them toward Paulet Island. After two months and numerous failed attempts to reach the Island, they set out in their life boats and landed on Elephant Island. This was the first time they had stood on land in 497 days. With no shipping lanes even close by Shakleton made plans to leave the ice floe with five of his men to attempt to reach Georgia. Here is the part of the story that get my attention. 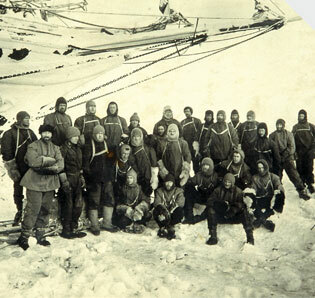 Shackleton gave the order that each man was limited to two pounds of gear for their personal items. To illustrate just how serious he was, he threw away his personal gear in front of the men…..then he help up a thick book and said, “This is the ship’s Bible that was given to us by the Queen before this voyage. I am keeping only three pages.” He placed the Bible down on the ice and held up those three torn thin pages. Then he read one line: “Yea, though I walk through the valley of the shadow of death, I will fear no evil, for thou art with me.” Amazing, Shackleton knew that they were in a deep critical place but God was with them. For the next fifteen days they sailed through the waters of the southern ocean. Their little life boat was pounded by the powerful pummeling seas. Finally, they were in sight of the cliffs of Georgia. But this was not the end. They were trapped in hurricane force winds and had to ride out the storm but finally reached the shores of safety. After 36 hours of crossing the island they reached a whaling station were Shackleton sent a rescue crew to gather the other men left behind. All 28 men survived the ordeal each with his own story of survival. If you are going to survive your journey it will take a long obedience in the same direction. We live in a in a world where we can have instant everything. Fast food, Microwaved meals and instant coffee. That kind of living messes us up when we can’t have everything we want right now. 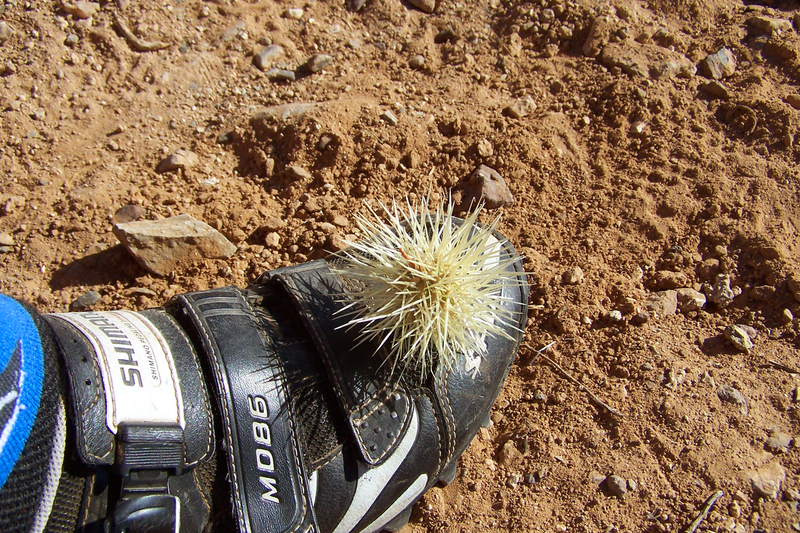 Sometimes a “wilderness experience” or a “trial” can make us feel like we are never going to get to our destination. (1) There seems to be no end in sight and nobody to rescue you. In Scripture the number 40 often represents long, hard struggle. Noah experienced storms for 40 days; Moses spent 40 years of loneliness in the desert; Jesus was tempted by the devil for 40 days. (Wow! Most of us can’t last 40 minutes!). (2) You imagine the unimaginable. The wilderness weakens your resolve. It makes you look for an easy way out. But God’s Word says, “If you will listen diligently to the voice of the Lord your God…you shall be above only, and you shall not be beneath” (Dt 28:1&13 AMP). The difference between being under the situation and on top of it, lies in one word – obedience. Want to get on top of things? Do what God prompts you to, and be resolute about it! Keep a Long obedience in the same direction and you will reach your goal.